Yoga is ‘union’ and there is no greater path to union than that of the relationship between parent and child – and a parent’s relationship with themselves. Where else do you have the challenge and opportunity to be your most mindful at each moment? Where your every communication has the potential to create conflict or upliftment? Children respond either consciously or unconsciously to each moment and can make us painfully aware of our gaps in awareness. The swell towards Yoga as a tool to improve the quality of our lives continues to grow. Nothing beats a consistent daily spiritual practice in maintaining awareness of ourselves and interactions with others. If you connect with your deepest self on a regular basis, you will enhance your relationship with others as a result of enhancing your relationship with yourself. And there is no greater motivation to maintaining awareness and enhancing relationships than having a child in your life. There will always be new challenges in parenting but yoga can help to meet each challenge with grace and equanimity of mind. There are some great tools in Yoga to deal with times of emotional crisis. Just remember a time that your child is cajoling, whining, maybe even screaming – pushing all those buttons for what they want. Step away, go to the bathroom, laundry, kitchen, or wardrobe and close your eyes. Breathe long and deep and listen to the breath within rather than whatever sounds are emanating from without. Go to an inner space where only you and your breath exist. Now open your mouth into an “O” shape and inhale as though you are drinking from a large straw. Close your mouth and exhale through your nose. Do this for a couple of minute and see how your feel. This type of breathing calms the nervous system, allowing you to return to a balanced mental and emotional state. Take some time before returning to the drama and when you do, allow your communication to come from a calm, confident, neutral, open and centred space. Remain in that space even if your child resists. They will sense that the trauma of the drama has lost its power and respond accordingly. An even better way to help a child deal with crisis is to give them the tools themselves. Teach your child the “O” breath when you are both in a calm and balanced space and let them know that if they ever feel angry or out of control, that they can use it themselves. Another great tool is the No/Yes meditation. The child sits with their eyes closed and for 1 minute or so just says “No” – they can think about all the times they wanted to say no and couldn’t, it can be whispered or shouted, spoken fast or slow, just get all those “No’s” out. And then they say “Yes” for at least the same amount of time as they said no, again they can think about all the times they wanted to say yes and get all their “yes’s” out of them. This is a great way to for a child (or adult) to deal with frustrations and is one of the favourite meditations in my 5-9 year old yoga classes. Share the wealth and beauty of breath and sound awareness with your child. Not all at once, but in small incremental steps and at just the right time for them. Light a candle before bed and create a beautiful sound together. Sit holding a feather and see how if moves differently if you breathe through your nose or your mouth, or if you breathe long and deep or quickly. Practice “Bear Walking” to get grounded with the earth element, and “walk off” tension. Get into Downward Dog Pose, and begin walking all around the room, or better still, outdoors on the grass for three to five minutes. You will find yourself walking in a natural pattern of right arm forward, followed by the left leg, then the left arm, followed by the right leg. The legs and arms are straight, but not locked. The bottom is up in the air. Give some big growls – this is a perfect exercise to share with a child. It becomes easier to use yoga as a tool for balance with children when you yourself bring balance to your life with yoga. Your child sees that example and their unconscious mind tells them that it is natural to find balance through yoga. My 9 year old daughter Caitlin has been around yoga since before she was born and she sees yoga as something that you just do, like waking up and having breakfast. She pulls out her own mat and does a few poses, breaths a bit, sings for a while, gets a bit silly and then lies down in Savasana, corpse pose, while I pick her arms and legs up and wobble them like spaghetti to see if she really is relaxed. Children thrive on ritual – create a special time of the day for yoga, morning or evening. Often this will be a child’s only opportunity to practice relaxation. Creating a special space for yoga decorated with pictures and objects that have special meaning to your child, perhaps on a small table or box. Feathers, crystals, shells and other natural objects are ideal. A candle may be used for setting the scene or for focusing on during quiet meditative times. Begin by closing your eyes, and taking a few deep breaths to centre and if you have a chant, sound or breath that you use to “tune in” and get ready, then use that too. Up to 5 years of age, 10-15 minutes is a good length of time to do yoga in the home. For school aged children, 20-25 minutes may be more easily practiced, even up to 45 minutes. Practice each posture for 30 seconds to 1 minute. Increase the time as the child progresses and is able to focus for longer. Try to include a couple of minutes of relaxation at the end, maybe using a guided visualisation to encourage imagination. Perhaps even include a meditation like the No/Yes meditation. And remember, the big difference between creative movement and yoga is breath – remember to focus on breathing in and breathing out and include a couple of big deep breaths like blowing up a balloon or blowing out candles. Start simply and build the practice slowly. F-U-N, those three little letters that are so important! Entice your children with engaging postures. For young children, make up yoga stories using animal poses. For older children, challenge them using a timer (“Let’s see how long we can hold this pose with deep breathing!”). Use creativity and humour. Amanda Reid discovered the joy and immense benefits of Yoga in 1992 and has been teaching since 2000. 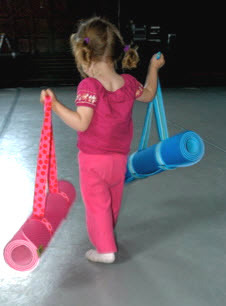 She is now taking registrations for her Radiant Child® Yoga Program (RCYP) – a comprehensive training program designed for anyone who is interested in teaching children yoga. Amanda has teaching qualifications in Integral, Satyananda and Kundalini Yoga, Basic Certification and Advanced Levels 1 and 2 of Yoga for the Special Child programme, and Radiant Child Yoga (RCYP1-3 and international facilitator training). She is an E-RYT200 Yoga Alliance teacher and member of the International Association of Yoga Therapists. Amanda is also an Infant Massage Instructor, massage therapist and naturopath. She uses complementary therapies, body therapies and Yoga to support infants and children with special needs, pregnant women in conscious birthing and parenting, and adults with chronic health conditions. Amanda teaches RCYP workshops in New Zealand, the UK, Ireland, and South East Asia (including Hong Kong, Malaysia and Vietnam), leads Yoga and Ayurveda retreats, and facilitates a RYT200 teacher training program in New Zealand, Australia and the UK specialising in Yoga from pregnancy to teens.